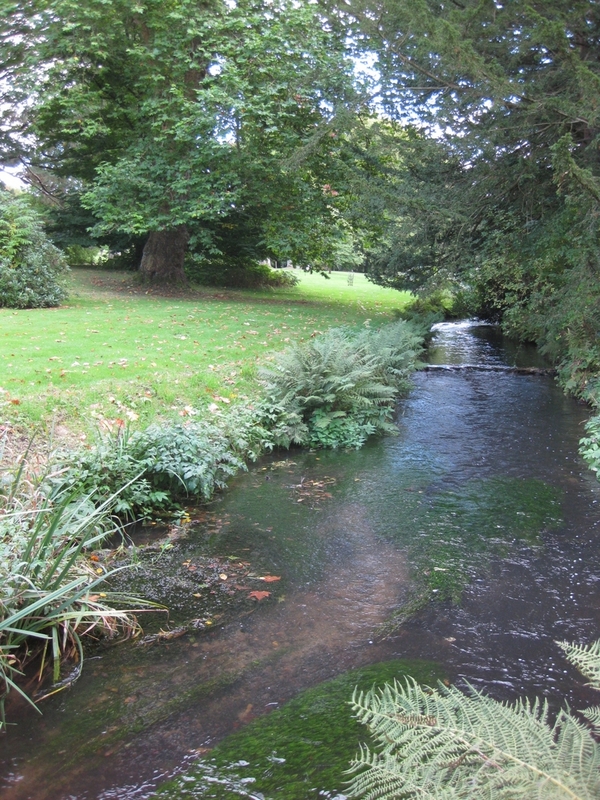 Wotton was the first on my list of Evelyn-related places to visit this year, and last weekend I spent my birthday there. 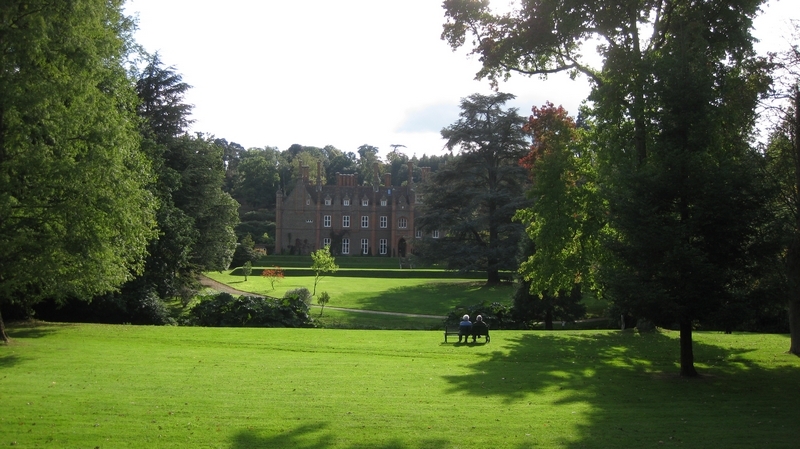 The house is now a hotel and conference centre owned by the Principal Hayley group. 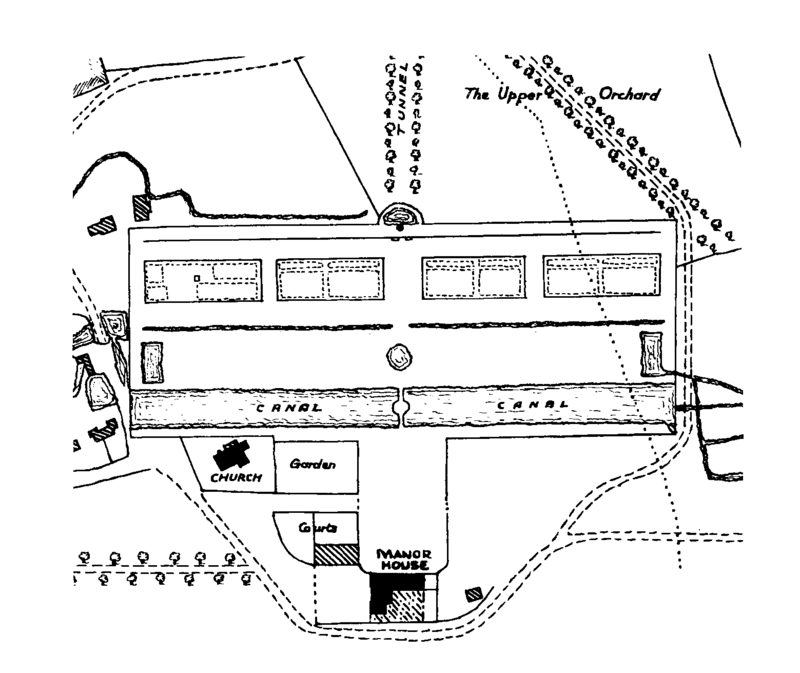 In Evelyn’s time the house was timber-framed, with a main block flanked by two wings projecting to the north enclosing a u-shaped court. 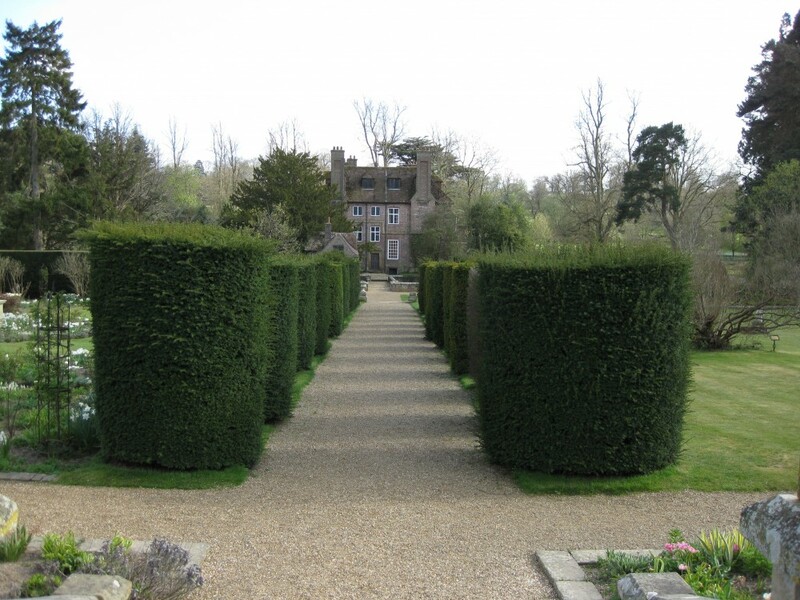 The garden lay to the south, and this is where John Evelyn first experimented with Italian-style design from the 1640’s onwards. 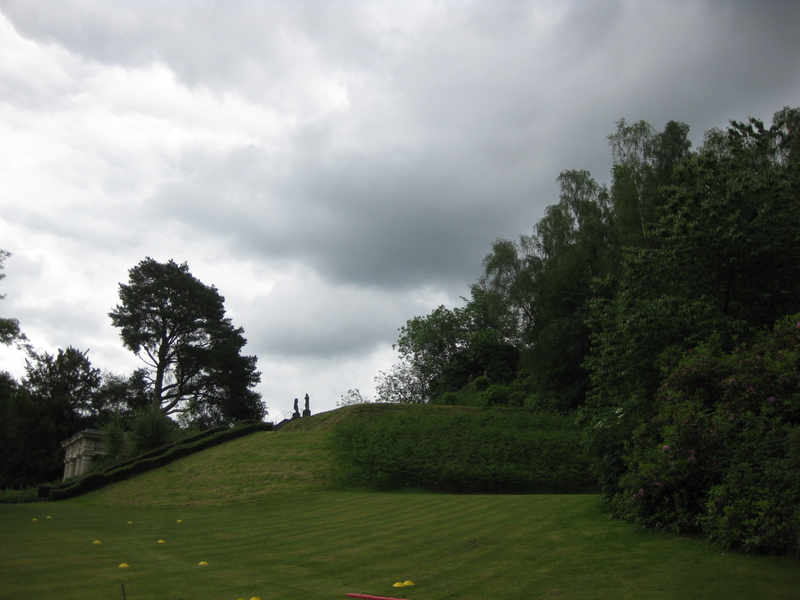 There he created a parterre with a central fountain and viewing terraces to either side. 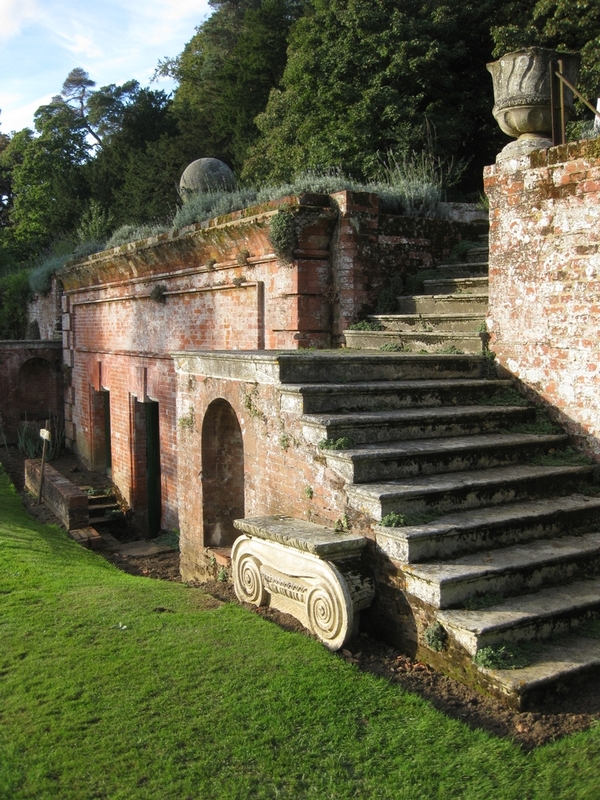 To the rear the natural hillside was terraced and fronted by a classical portico and grotto. 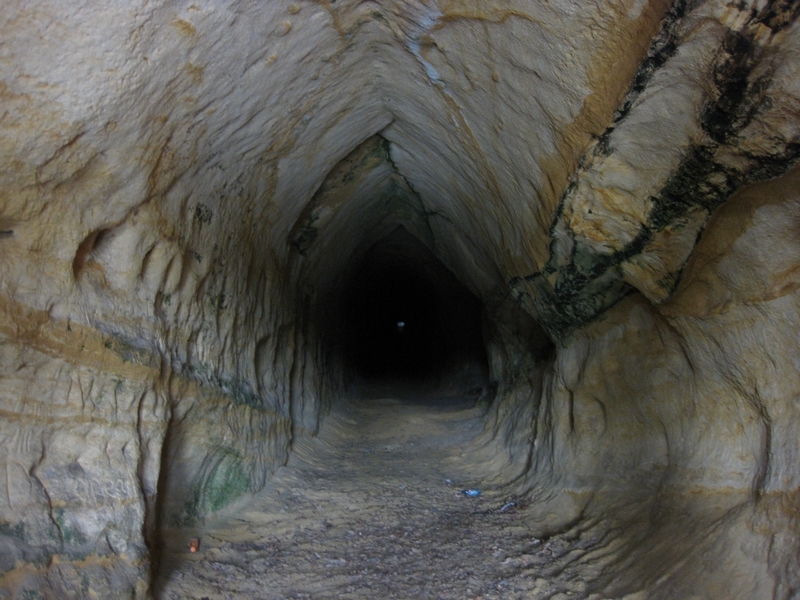 The grotto was adorned with statues, of which only the Venus now remains. 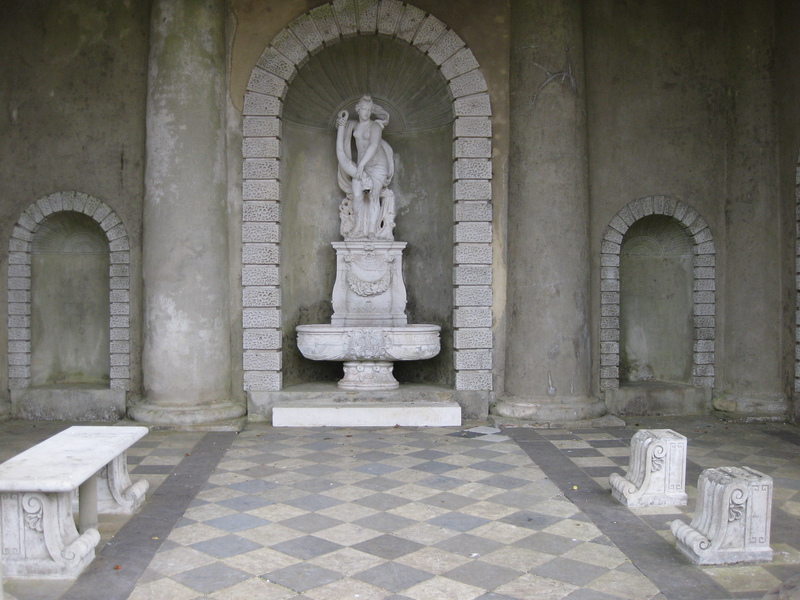 The walls of the niches were encrusted with corals and shells that glittered behind gushing fountain-jets. 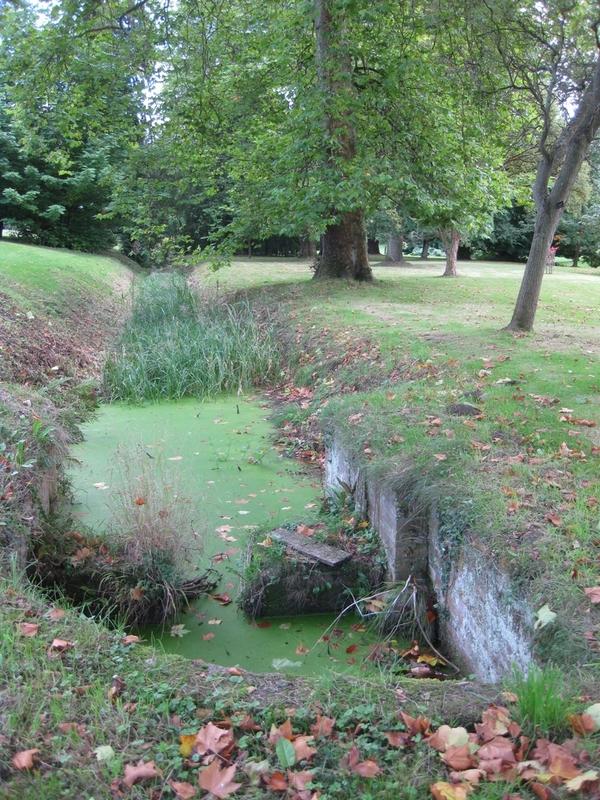 All of this was achieved thanks to a system of ingenious conduits that diverted the flow of the natural streams that run through the grounds. 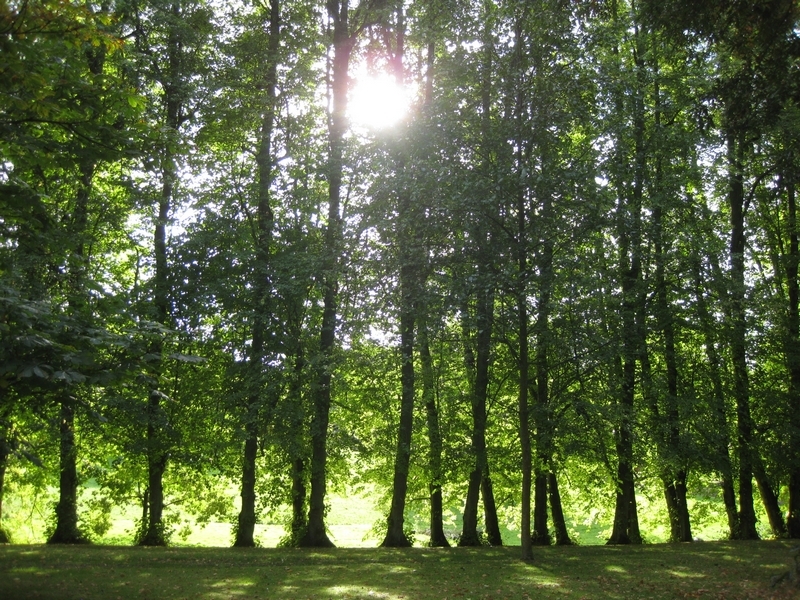 The mound was planted with beech trees which have since vanished, along with apparently all other vestiges of the seventeenth century planting. 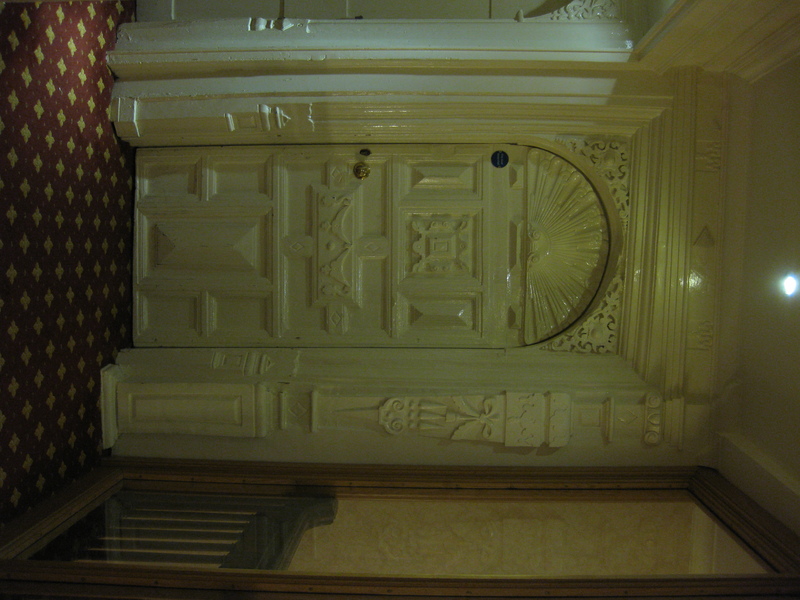 There is some uncertainty about the date of the statues of the four seasons that flank the central access stairway. They would certainly fit in with Evelyn’s theme here, derived from Epicurean philosophy, of the powers of nature (represented principally by Venus). At any rate, all four seasons apart from Winter are now headless, which is rather sad. 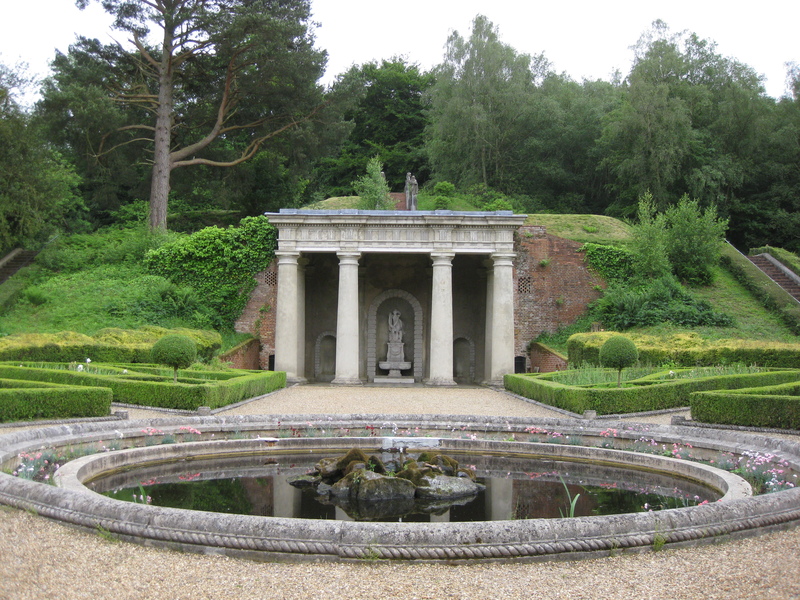 I have to say that the evidence of these and other broken statues, fountains and benches and the detritus of wedding revels leave one feeling that this rare survival of seventeenth century garden design is not being properly cherished by the current owners. Careful archaeological investigation might be able to recover the plan of the parterre. 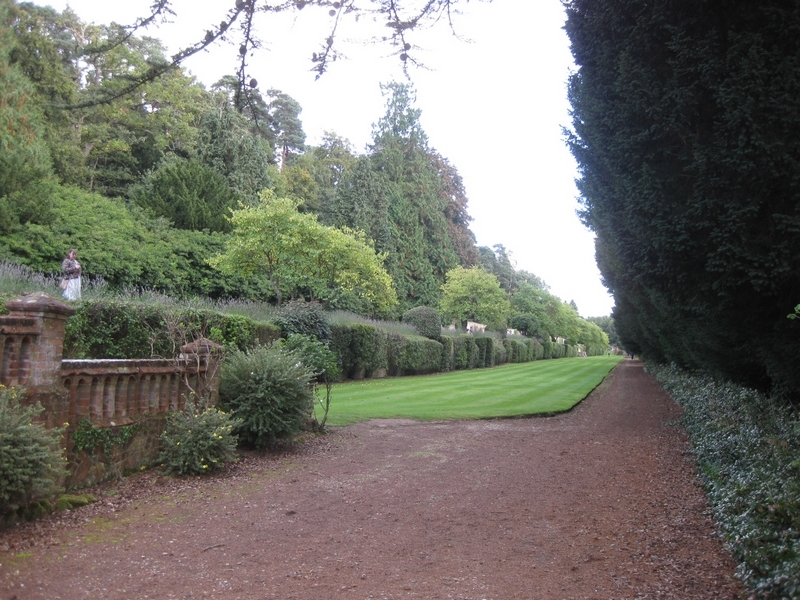 That area as well as the former orchard and kitchen garden to the east of the house are now just grassed over. 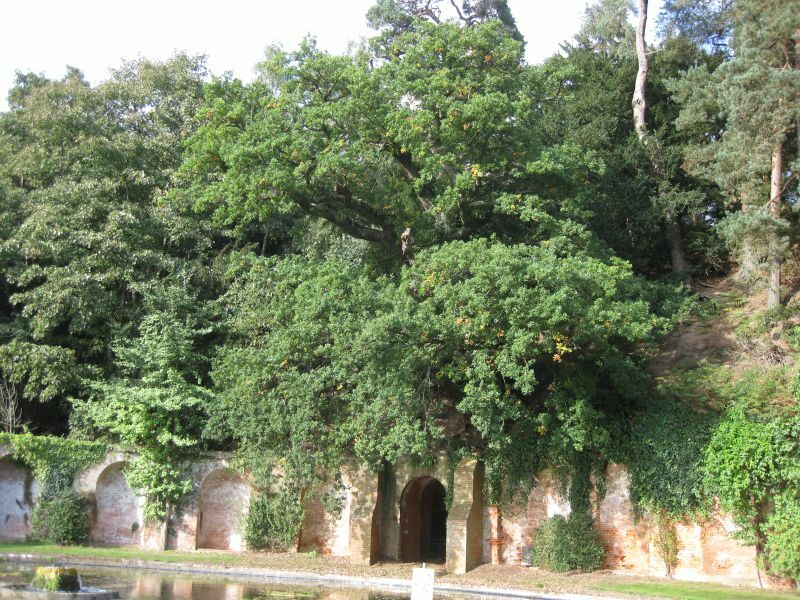 If the neglected water features were repaired, and the garden replanted in period style, the result would be truly stunning. It would also, of course, attract many visitors. The house itself has been much altered since the seventeenth century. Refaced in brick and extended in Victorian Gothic style, when it passed out of the family’s hands all its original furnishings and fittings went too.There remain a few beautiful Jacobean and Elizabethan doors, and interesting nooks and crannies. 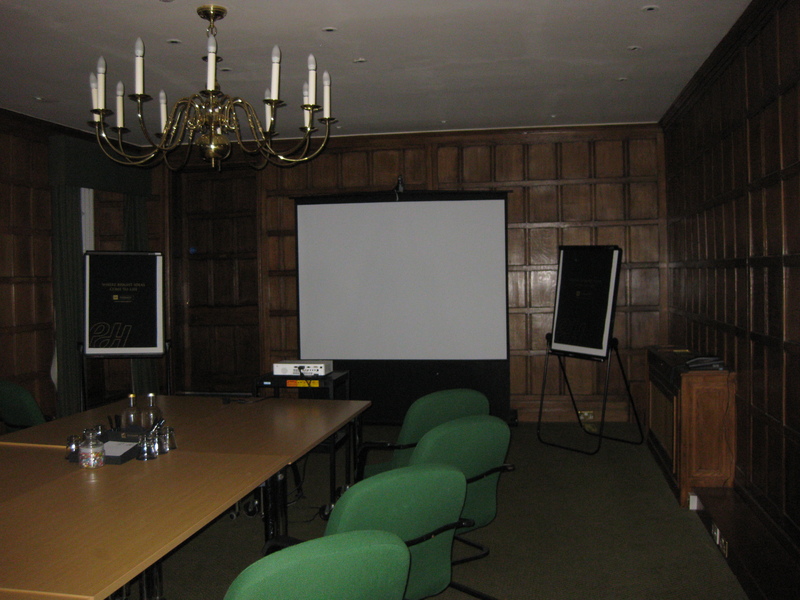 However, all the old heart of the house is reserved for corporate training and conference events, as well as wedding parties. Hotel guests stay in a modern accommodation wing, where the rooms are, frankly, bland and overpriced. It was next to impossible even to get to see any of the older rooms, as they were nearly all declared to be either in use or off-limits. 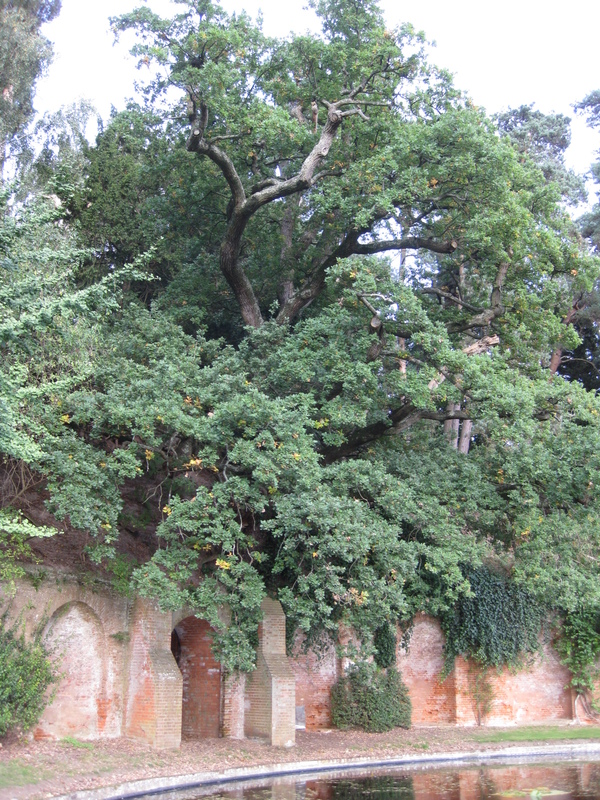 Here, nevertheless, is a glimpse of the room where John Evelyn may have been born – or could it be the one next to it?! 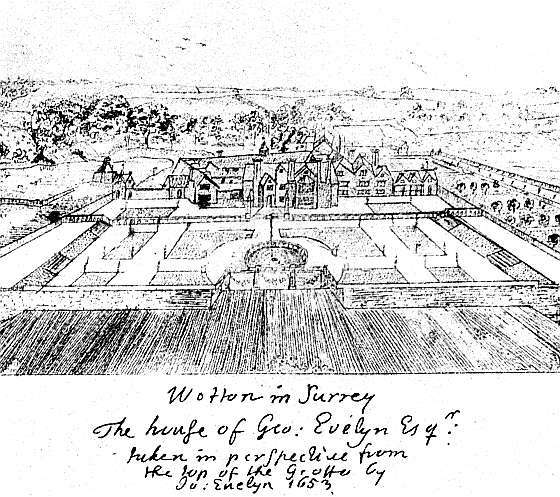 All photos by the author except for the Evelyn sketch scanned by Jacqueline Banerjee, from http://www.victorianweb.org/art/architecture/homes/33c.html For more information on the garden, see Small A. & Small C., John Evelyn and the Garden of Epicurus, Journal of the Warburg and Courtauld Institutes, vol. 60 (1997) pp. 194-214. 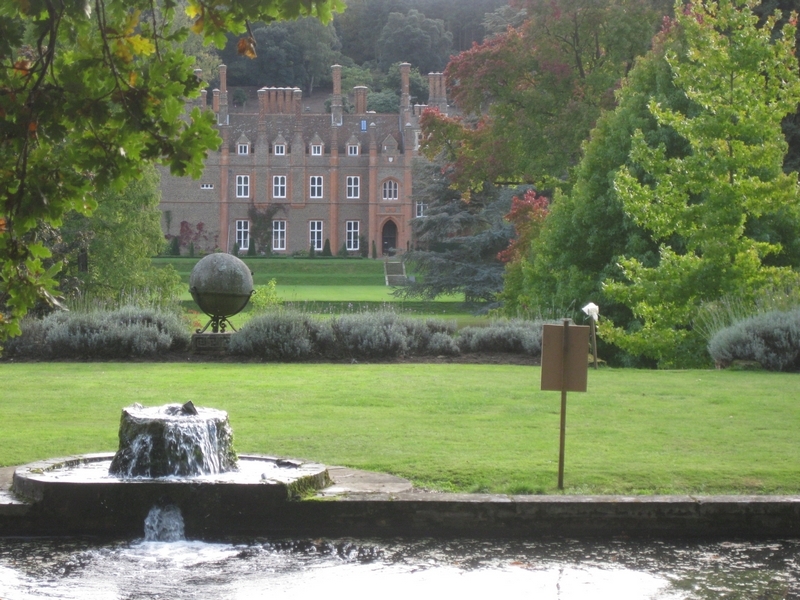 For the basic historical facts on the house, see here http://en.wikipedia.org/wiki/Wotton_House,_Surrey and for details of the architectural features, see here http://list.english-heritage.org.uk/resultsingle.aspx?uid=1189814. 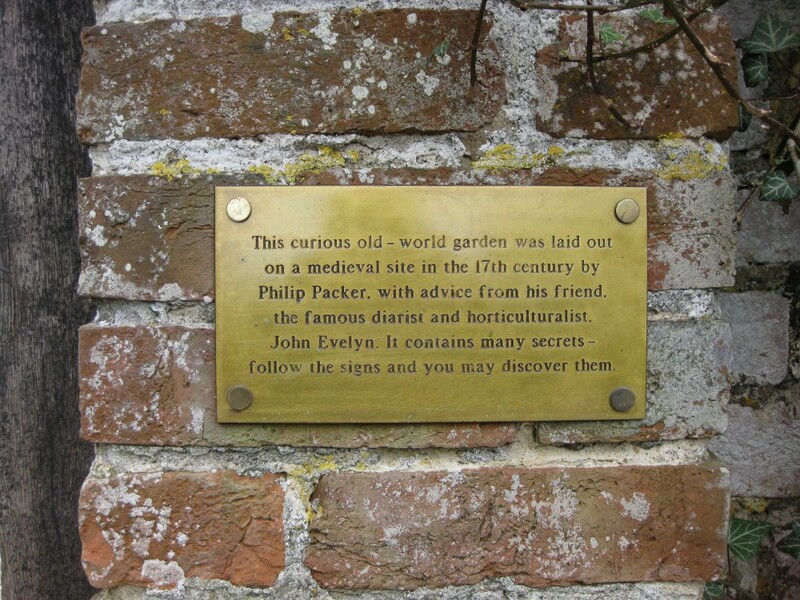 Sayes Court was not the only garden that John Evelyn had a hand in. 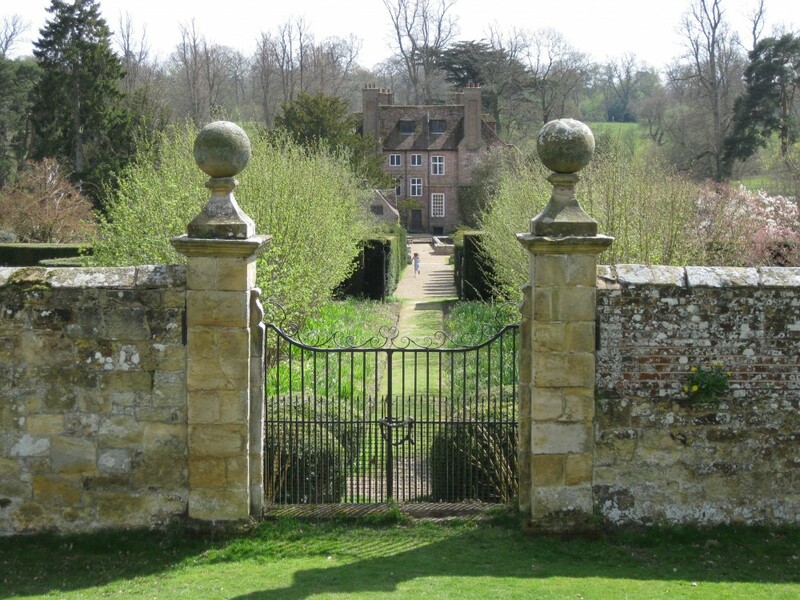 His advice was sought on garden design by numerous landowners, including his friend Philip Packer, who lived at Groombridge Place in Kent. 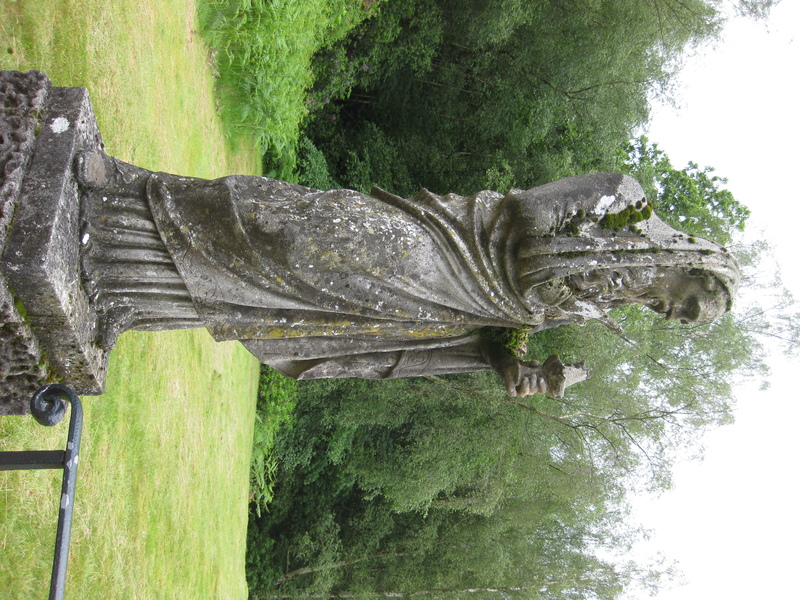 Fortunately, the gardens at Groombridge Place escaped both the ravages of the landscape movement, and the neglect that has afflicted Sayes Court. 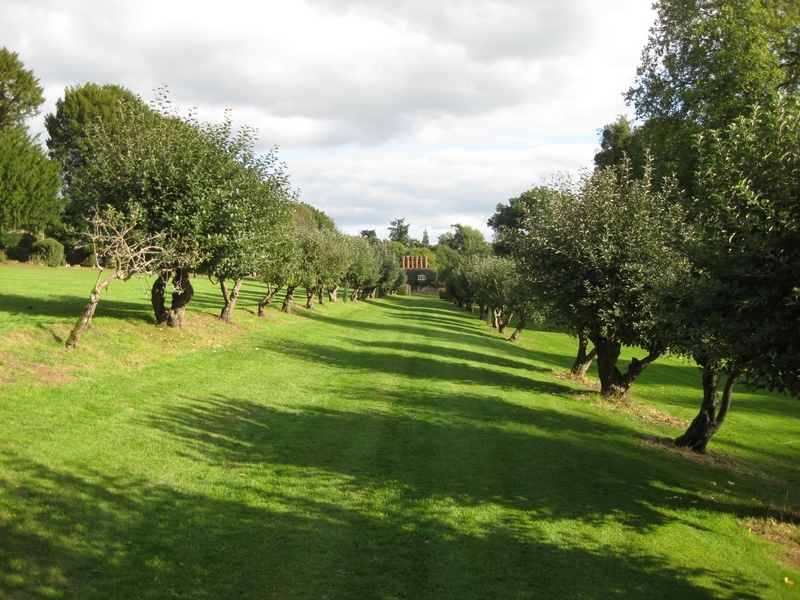 The original seventeenth century layout that Evelyn was consulted on is still visible, and although most of the actual planting has altered, there are still fascinating remnants of it here and there. This is a good place to visit to get a general feel for how Sayes Court might have been, and, feeling in need of a little inspiration, last Sunday I spent a very enjoyable afternoon there drinking in the atmosphere and taking photos. 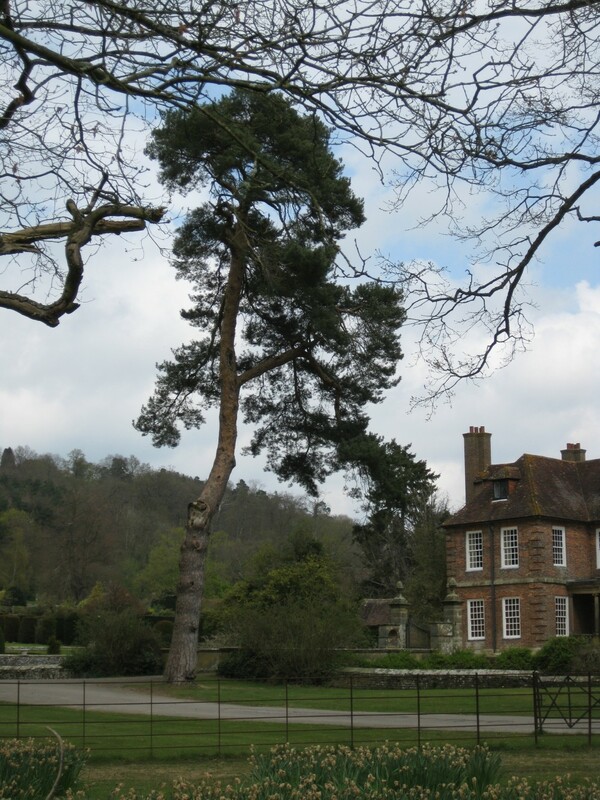 As you approach the house, to the right of the bridge over the moat you see a soaring Scots pine, said to be the remaining one of a pair that Evelyn planted in the 1670s. 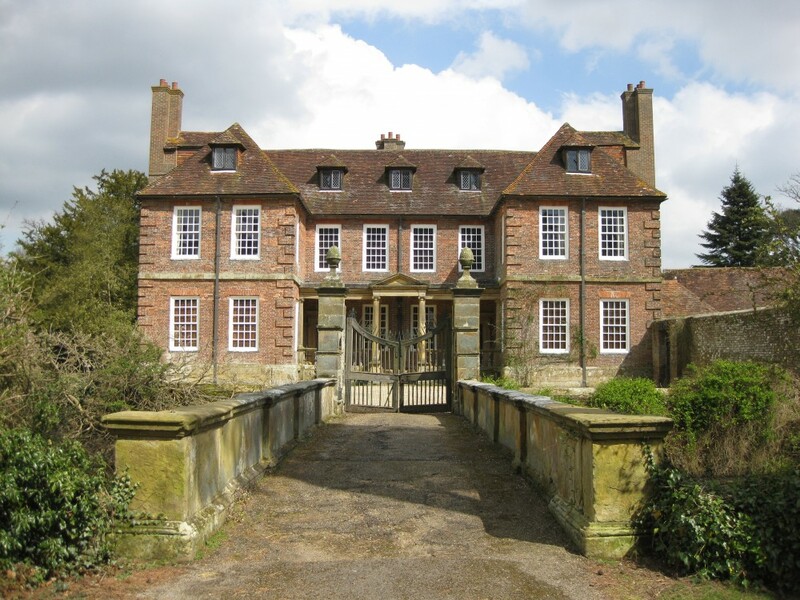 Although the house itself is sadly not open to the public, the outside looks not too dissimilar to what we know from the few surviving depictions of Sayes Court – two main storeys, and classical columns in the porch. 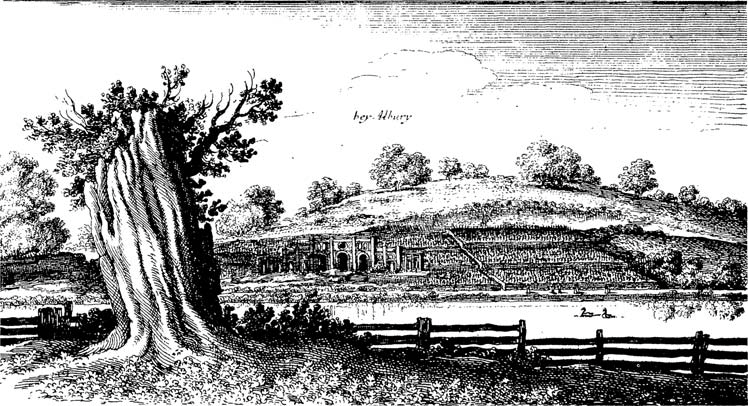 Perhaps it is a little grander, but not much – both places started off as mediaeval manor houses, after all. 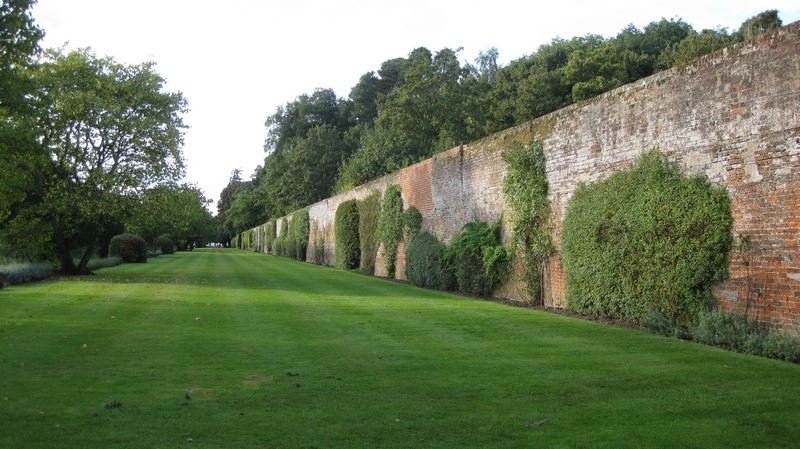 The paths, walls, gateways and main divisions or rooms of the garden are still much as they were originally set out in the seventeenth century. 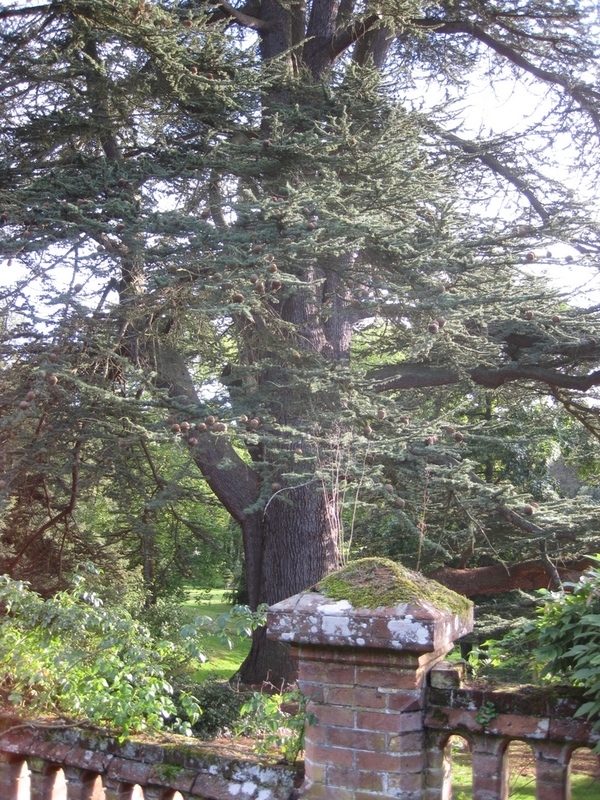 The central axis pathway is called “The Apostle Walk”, because it is bordered on each side by twelve yews clipped into drum shapes, believed to have survived from the 1674 planting. Another seventeenth century feature which Groombridge Place had in common with Sayes Court was a banqueting house in which the Packers and their guests would have enjoyed light refreshments, more like picnics than what we would call a banquet today, of cakes, fruit ,wine, or tea, still an exotic luxury then. 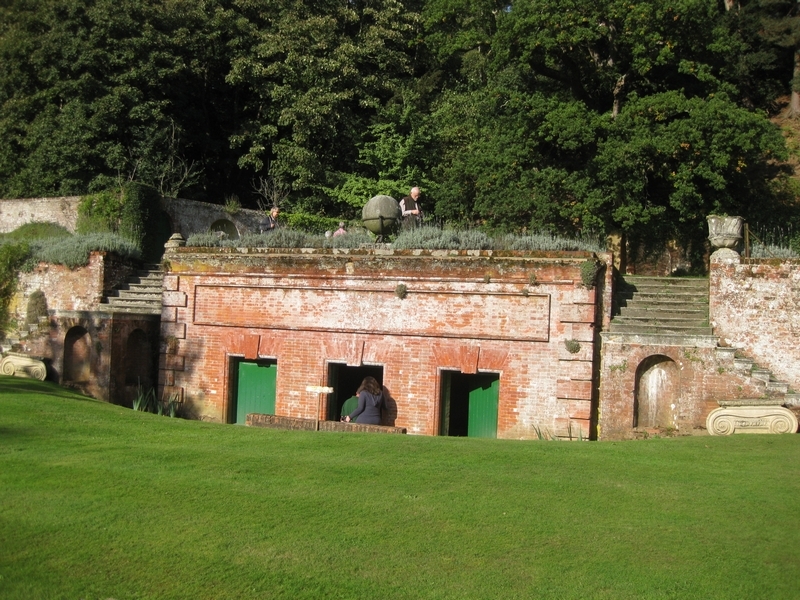 This building, subsequently altered and enlarged into a cottage, leads onto a raised grass walk described in the guidebook as a bowling alley, although it seems rather narrow, and its position leads me to wonder if it might not originally have been a raised terrace perhaps for viewing a parterre below, as at Sayes Court? 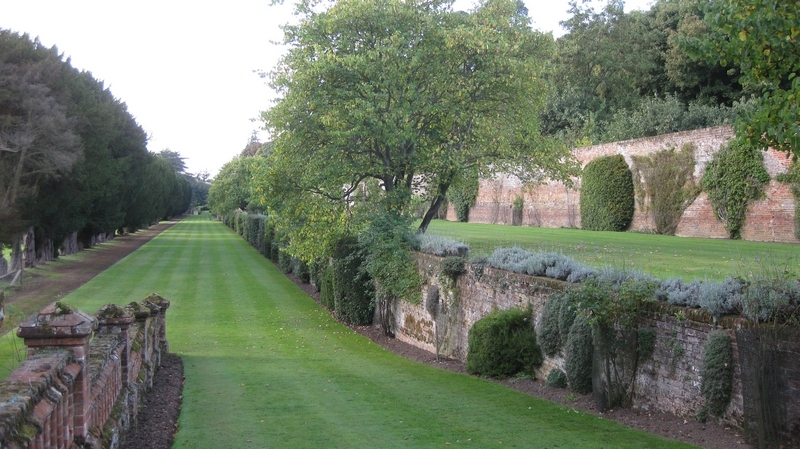 The narrow canal that crosses the garden is also part of the original design, although the colourfully-planted “Knot Garden” was only laid out in 1994. I do suspect that (proper!) archaeological investigation might find very interesting evidence for the earlier planting layout in this area and in the adjacent “Draughtsman’s Lawn”, named after Peter Greenaway’s entrancing film “The Draughtsman’s Contract”, filmed here in 1982. A more recently-filmed version of “Pride and Prejudice” allows a tantalising view inside the house itself. 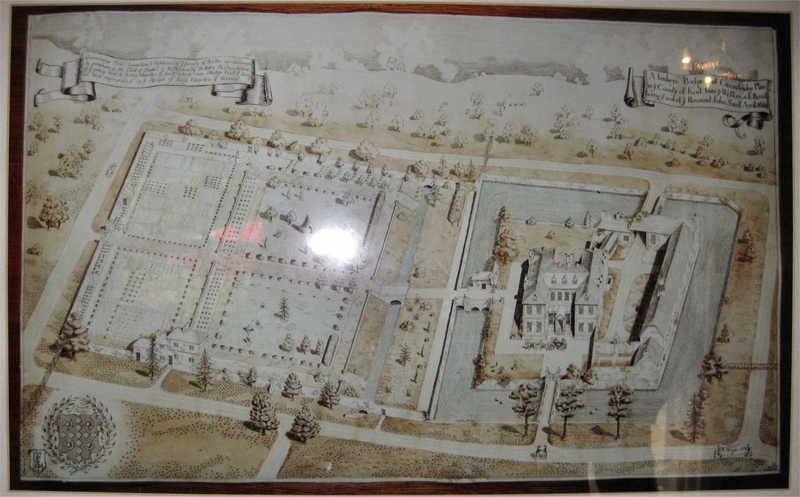 On the wall in the visitors’ restaurant, and rather awkwardly situated to photo (my apologies for the poor quality shot) there is a picture of a nineteenth century plan that purports to show the gardens as they would have appeared in the seventeenth century. What this is based on, I don’t know – was there an earlier painting or drawing available to the artist? If anyone reading this can enlighten me about it, I’d be very grateful. 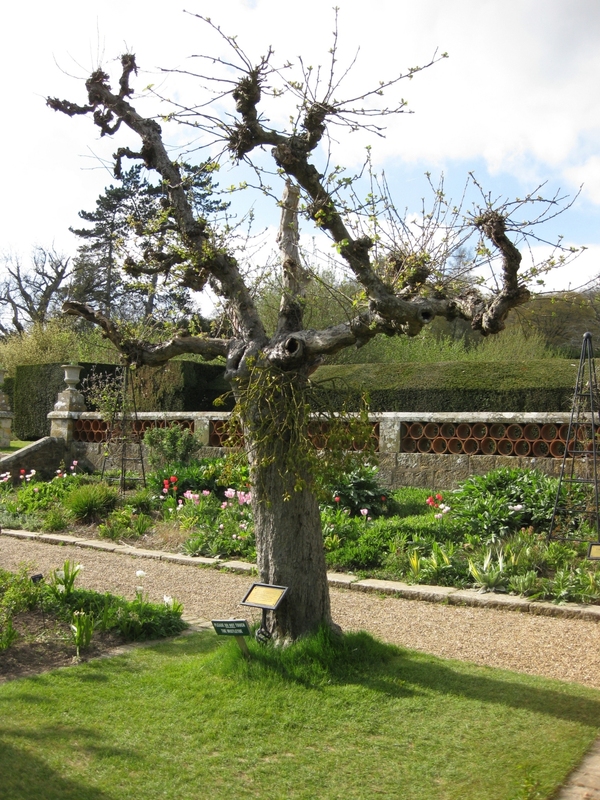 There are three ancient apple trees in the “White rose garden” that remain from the orchard that existed there in the seventeenth century. 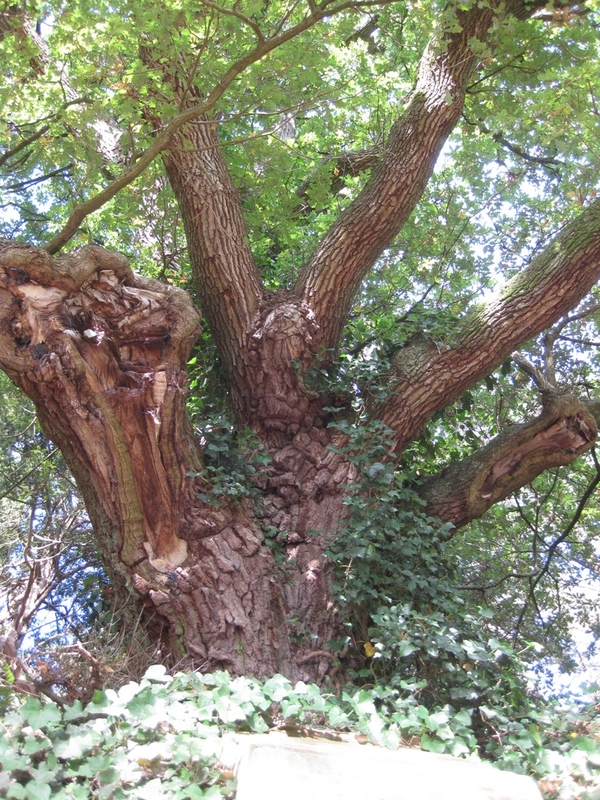 The one in the photo still apparently produces fruit, despite its great age and the mistletoe growing on it! I wonder what variety it is?